Now that Osiris is dead, Black Adam is spontaneously struck by magic lightning which returns Adam's 'Black Marvel' power to him. Adam realizes something is wrong and he and Isis come on the remains of Isis's Sobek-satiating sibling. Sobek admits he's really the last of the Four Horsemen - Famine - and that only the meat of a Marvel can satiate his hunger. This was an Intergang-orchestrated plan as payback for keeping Intergang's supply lines out of Kahndaq. Adam and Isis are attacked by the Four Horsemen - Famine and his siblings Pestilence, War, and Death. It turns out that Pestilence is responsible for the famine that has plagued Kahndaq. While War preoccupies Adam, Pestilence poisons Isis, and Death gets ready to inflict his blow. Adam defeats War. Death turns from Isis and attacks Adam. With her dying breath, Isis uses her powers to save Adam. As she dies in Black Adam's arms, Isis tells him that she was wrong, that Adam wasn't the one who needed to be redeemed, that Adam's way worked and kept Kahndaq safe. Her last words to Adam: Avenge us. Isis's power returns to Adam. Adam looks pretty angry. Meanwhile, in Nanda Parbat, Renee notices the flower Isis gave her has crumbled to dust and realizes Isis is dead. She's encouraged to leave Nanda Parbat and head back to Kahndaq to find out what's going on. She's given a make-shift Question costume but Renee says she's not going to become him. She puts on the Question's fedora. Story - 4: Couldn't you have eaten Hoppy the Marvel Bunny instead? OK so DC got me - I loved Sobek and totally bought into the fact he was just the Black Marvel Family's version of Tawky Tawny. And he turns out to be the last of the Four Horsemen, Famine. Two of my favorite characters to come out of 52 - perhaps because of their innocence and naiveté - are dead. Making us like these characters - both created and killed during the course of 52 - and then depriving us of them, it certainly makes Black Adam's likely coming rage against the world relatable to us mere mortals. I do have concerns with, once again, the DC Universe unfolding like a bad M. Night Shyamalan flick. One crucial presupposition, an assumption about the status quo, is totally off the mark. We're going to pull the carpet out from under you and you're going to love it once again. Silly fanboys and girls, Dr. Light didn't kill Sue Dibny, it was something totally unexpected because you didn't know that Jean Loring was secretly a few dwarf stars short of an atom. The DCU's been all about this kind of flip-flop in character going back to "Identity Crisis". Most of these soap-operatic revelations still work but I can't shake the feeling that the new DCU status quo is that things aren't ever as they seem and that in and of itself has the potential to become predictable over time. The real-time aspect of 52 seems to be falling by the wayside a bit in the series closing weeks as the writers are seemingly rushing to bring each of the storylines to a head. We're asked to believe nothing else happens for six days during week 44? I have a hard time swallowing that, just as Sobek did with parts of Osiris. I wish at least one of the major storylines would have wrapped up about mid-way through 52 - things don't happen to everybody on the same timeline and that would have helped convey the real-time aspect of the story better. My favorite part of the issue? No secret origin back-up. I have found them mostly pointless. 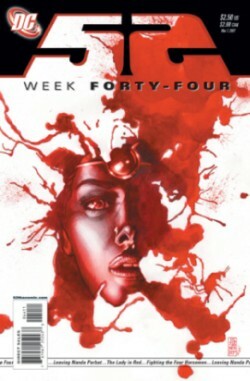 This is my second review in a row (I review every fourth issue - hey I only have two more reviews and I get the last word with the review to issue #52) without a secret origin and I'm grateful. Art - 5: The artwork on this issue - in particular the staging of the death-of-Isis panels by Keith Giffen - is tremendous. Cover Art - 5: What a disturbingly beautiful image. I don't think it gives away the fact that Isis dies inside, it could simply be intended to evoke Isis's discovery of her brother's death. Yet the cover becomes more powerful, significant, and relevant to the issue after reading the issue. Well done.